Ten Russian experts will aid the Indian Air Force and HAL in conducting a complete evaluation of the fleet of around 200 fighters. A team of Sukhoi experts from Russia is in Pune to carry out a technical evaluation of Sukhoi-30 (Su-30) fighter planes, PTI News reported. The Indian Air Force (IAF) has grounded its fleet of Su-30s pending a technical review, following the crash of an aircraft last month. A team of 10 Russian experts along with IAF personnel and officials from Hindustan Aeronautics Limited (HAL) are in the process of conducting a complete evaluation of the fleet of about 200 twin-engine fighters, the news agency cited IAF sources as saying. The fleet of about 200 Su-30 jets currently grounded represents almost a third of the country’s fighter fleet. The IAF is due to purchase another 72 Su-30 jets from Russia. The Pune Mirror reported that preliminary findings of last month’s crash had suggested a technical problem in the fly-by-wire system as the cause. An IAF Sukhoi-30 MKI crashed into a field in the Pune district on October 14. There were no casualties as both the pilot and the co-pilot had ejected to safety. IAF sources told the Pune Mirror that one of the pilots was involved in a previous Su-30 crash as well. The sources added that the fleet had been grounded twice earlier. When the fleet was grounded last month, sources close to the situation told RIR the announcement may have been a scare tactic employed by those with vested interests in the Rafale deal. “Create a scare and then generate media pressure so that the government will buy the Rafales for terms that are more suitable for the French than they are for India… these are old tricks,” a retired IAF officer who worked closely with the Su-30MKI had said. The Su-30 MKI, NATO reporting name Flanker-H, is the IAF’s elite fighter-bomber. 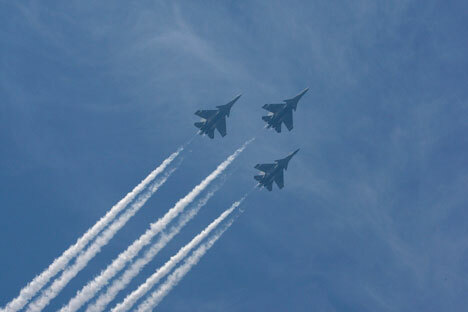 It was developed by Sukhoi Aviation Corporation and built under license by HAL. The Indian Air Force has lost more than 35 planes and helicopters to crashes in the last three years.